Central Avenue Health Centre is Saskatoon's one stop for health. We offer a variety of complimentary services that include chiropractic, acupuncture, massage therapies, orthotics, reflexology and aromatherapy steam rooms. Our state of the art facility allows us to treat and diagnose you without invasive operations. The steam rooms are private and include showers and speakers and are unique to the city. We also offer custom orthotics through our partnership with Canada's largest orthotic laboratory, The Orthotic Group. 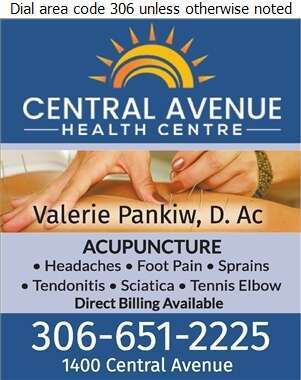 Central Avenue Health Centre also has an acupuncturist on staff, should that method of treatment be required. Come in today to see how we can help you feel like new again.